Continued from Teenage Mutant Ninja Turtles #6. Casey attends April’s wound, which apparently isn’t too grievous. Leonardo and Jones discuss what happened, wondering who sent the robot. Casey makes some tea for April and spots the federal agents spying on them. Raph and Mike return and report that they didn’t find anything. Later that night, Casey attacks the feds and grabs their briefcase, discovering that the robot is controlled by Baxter Stockman. The next day we see April and Shadow leaving with Casey’s aunt, who is taking O’Neil to her place so April can get some respite from the previous day’s events. The guys discuss what they should do and Leo suggests that they wait, as Baxter will reveal himself. Soon after, Stockman issues another threat by entering a skyscraper and shooting out windows so that a giant message, “April I’m coming for you tonight,” can be read by the entire city. The three TMNT and Casey head out to the building to confront Stockman, but find it surrounded by police helicopters and S.W.A.T. teams, making their approach difficult. The team splits up to climb to higher vantage points to get a better view of what’s going on. Leo and Mike run into the killer ‘bot almost immediately. After some choice words are exchanged, Leo and Mike attack the Baxterbot, but are brushed away like flies. Raph and Casey show up, but the robot has little trouble defeating them. Just as Stockman is about to finish Raph, Donatello appears with Nobody. 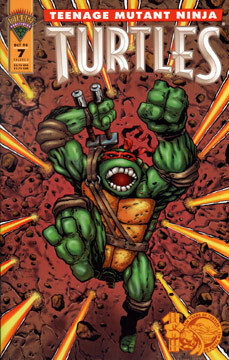 Continued in Teenage Mutant Ninja Turtles #8.